Issue academy of develop industry according to TrendForce banner newest statistic, battalion of the first season accepted firm of design of before the whole world 10 big IC 2018 reach a rank to give heat, besides couplet hair division (the battalion of the science and technology of MediaTek) and couplet that chant closes outside presenting decline, 8 manufacturers all present the others to grow posture. Among them, rich is connected (Broadcom) closes with the battalion of 4.81 billion dollar hold head of a list of names posted up, grow 15% compared to the same period. And connect high (Qualcomm) and Ying Weida (after NVIDIA) parts to tighten up therewith with 3.897 billion dollar and the battalion of 2.79 billion dollar, hold the 2nd mix the 3rd. Later ordinal it is couplet hair division (1.694 billion dollar) , 100 million dollars of AMD(16.47) , Sailingsai (673 million dollar) , Marvell(6.05 100 million dollars) , lucky sunlighting semiconductor (362 million dollar) , couplet chants science and technology (357 million dollar) with Dialog(3.32) of 100 million dollars. The Gaotong that pays close attention to most in the light of the market and couplet hair division, ocean of Yao Jia of analyst of academy of develop industry points out, from 2017 the end of the year begins, because be inferior to expecting the impact that rises with channel inventory by new machine sale, the traditional and off-season in advance of the first season reports for duty, manufacturer of each old mobile phone to market mood is relatively conservative 2018, affected plant of chip of two old mobile phones jointly this year the order state of the first season. Among them, although this year the first season hands over the achievement of 3.897 billion dollar,connect high, but relatively the 2nd season began 2017 successive the record that 3 season write down more than 4 billion dollar, the show that opens high is apparent very not outstanding. And the expression of the first season also is not couplet hair division this year ideal, battalion receives already consecutive the four seasons to appear year of decline, the battalion that observes nearly 3 season nevertheless receives expression, its wool interest rate has been answered gradually firm. Amount to like the wool interest rate that is the first season 38.4% , partial reason is P60 processor uses Cheng of 12 pay the metric system, have market competition advantage, add the cook again of the big plant such as OPPO, the high-end machine that uses P60 to roll out new generation is planted, although earlier shipment amount is limited, but pull to what integral gross profit leads carry still help somewhat. However, because P60 is,this year the first season is released, if want division of the hair that it is couplet to bring apparent battalion to receive contribution, answer the most quickly gain can see in the 2nd season. As to the two firms development in the 2nd season, yao Jia ocean thinks, because connect dragon of new generation brave high,the processor of 700 series still has no further information, the likelihood will affect big plant of main mobile phone to be developed in what high-end machine plants this year. If couplet hair division can be below the situation that does not affect wool interest rate, aggrandizement carries the active position to P60 in the client, and support technology of key client aggrandizement, connect forms for reporting statistics of money of the 2nd season high to be afraid now can get trifling concussion. 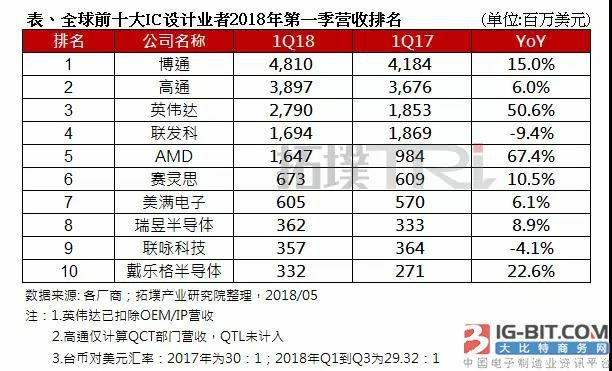 Can see in sheet of 10 a list of names posted up afore, performance is most excellent is AMD and Ying Weida (NVIDIA) , the battalion of two companies first quarter closes to grow compared to the same period respectively 67.4% with 50.6% . Yao Jia ocean thinks, the reason that AMD can have this show has a few: Above all, its operation and plot career group growing kinetic energy is quite driving, grow compared to the same period amount to 88% , drive integral battalion to restrain growth; Next, the corresponding period behaved AMD last year very not ideal; is final, because the whole world digs ore demand still fervent, drove the demand of chip of new generation plot, let AMD not only growing rate of the first season behaves bright look, gain profit to also be achieved nearly 4 years completely at the same time new tall, amount to 8, 1 million dollar. And NVIDIA is carrying high growing show all the time. Yao Jia ocean points out, NVIDIA is main and indebted at game and server market drive. Among them, the battalion of game domain closes amount to 1.728 billion dollar, the server is 669 million dollar, grow to be respectively compared to the same period 52.4% with 80.3% . Be worth what carry is, ying Weida is newest the money newspaper of one season shows, the income that there is 289 million dollar in OEM business comes from fictitious money, visible whole world digs mine upsurge to plot chip manufacturer, be benefited really quite much. The battalion of the 2nd season accepted firm of design of before looking into the whole world 10 big IC 2018 expression, yao Jia ocean thinks, before 5 should not have too big change, but the 6th reach the 10th to may have fluctuant. Notable is, as a result of perfect electron (Marvell) already bought Cavium certainly, will raise a net to connect further with server domain plan complete degree. Cavium from 2016 the four seasons begins, every season battalion closes to fall inside the 2 billion limits to 2.5 billion dollar. If this year the 2nd season plan the camp that enters Cavium closes, marvell surmounts organic meeting Sailingsai (Xilinx) , carry off the 6th position.